T-70 Days Until Departure for Maroon Bells Wilderness, Colorado | "What Goes Down, Must Come Up!" Take off for Maroon Bells 4 Pass Loop is only 10 weeks out. Need to start serious training (I’m talking to myself). We have some slots left, so still time to sign up. 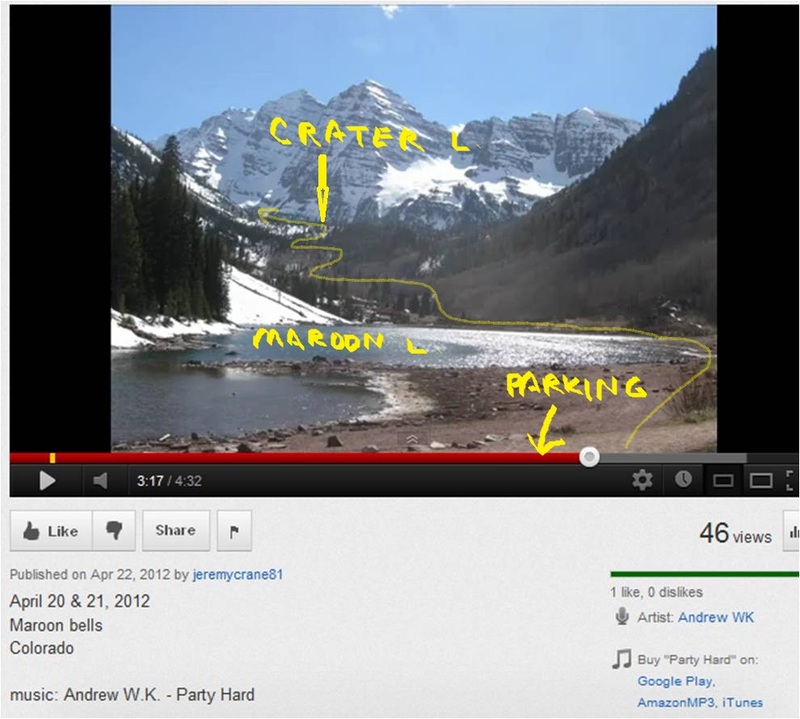 Photos of almost every step of the last trip 2010 can be viewed at the Maroon Bells Web Album (link on top banner here). Looks like the snow is already melting fast, that is good news. Hope we are can catch the wildflowers in max bloom. 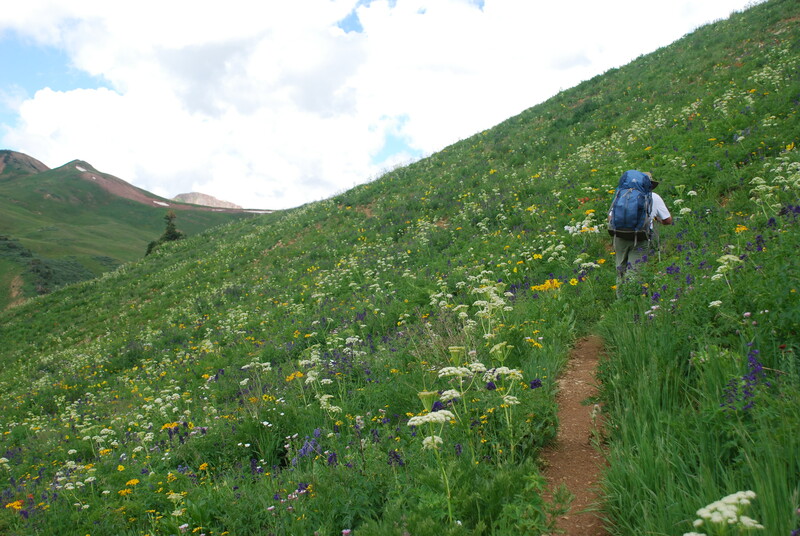 Looking at the amount of this year’s snowfall, the wildflowers will probably start blooming before we get there. Once again, the plan is to link up in Denver and convoy to Aspen (206 miles), with a stop at Wal-Mart in Glendale Springs (157 miles) for fuel, snacks, or whatever. It won’t bother me if other drivers chose to leave Denver at different times, dependant upon arrivals, etc. we just need to link up at the campground or ultimately at the trailhead monday morning. Monday, we’re only hiking to just above Crater Lake or where ever we can find a good campsite and spend the rest of the day acclimatizing to the altitude. I recommend we pick a restaurant to eat at before we get to the campsite. I know for sure we pass a Subway before we get to Aspen and I know there are many places to eat in Glendale Springs. Last time Geardog and I drove through Aspen, we couldn’t find a place to park so we said screw it and hit the road and ate at Subway. We will overnight Sunday at a campground near Aspen, get up early and get through the Maroon Bells Gate before it opens at around 0800, else we have to pay a day fee, regardless of it supposedly being free to park for overnight backpacking. I’ll try to make the reservations for the campground today. Coming off the trail on Saturday 25 Aug, I would like to drive back to Denver so I don’t have to kill myself to get to the airport for a 10 am flight on sunday morning. 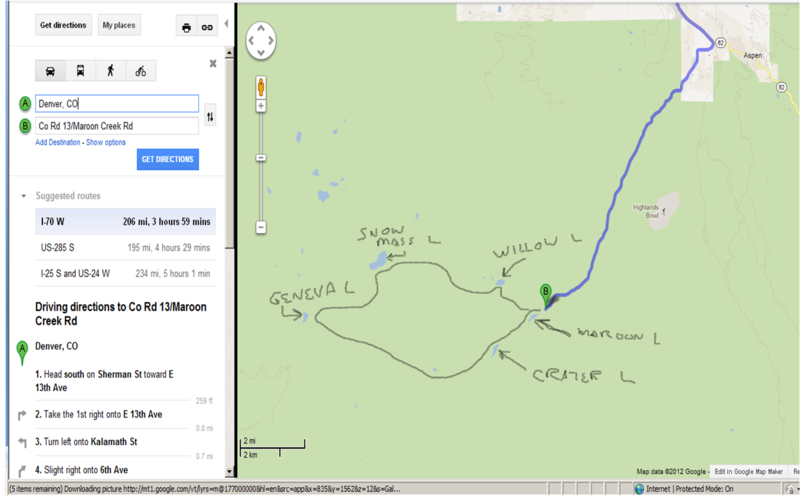 Here’s a screen shot of the area from google maps if you want to locate it and check out the terrain. This entry was posted in Maroon Bells 4 Pass Loop, Colorado, Meals and cooking on the Trail, Photography, Cameras, etc.., Weminuche Wilderness, Co and tagged 4 pass loop, colorado wilderness, maroon bells on May 17, 2012 by Dragin.